I am Brazilian and my fiancé is Filipino. 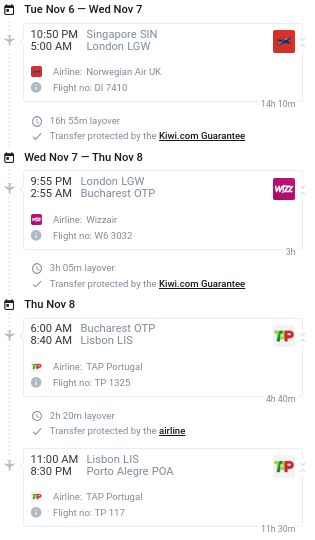 We are planning to go to Brazil from Singapore, and the few cheap flights we found have 3 different stops in 3 different European countries: London, Romania, and Portugal. We are only going to wait in these airports for the next flight. Does it require us a transit visa? We won't dispatch any luggage, just bring hand bags with us. Every airline will see their tickets separately and check that you have the right to enter the destination countries to check you in. Thus, with your connection, you will need to have permission to enter the countries UK, Romania, and Brazil. A visa for Portugal is not required. You should check the visa/entry requirements for each ticket separately. The answer to this question contains further details. For the UK they won't need a visa if they will not go through passport control. If they do, they will need a transit visa. If not going through passport control. If going through passport control. The only country in the Schengen area a Filipino would need an airside transit visa is France, so Portugal will be fine if they stay airside. See here. So as long as your fiancé stays airside during the connections they will be fine without any transit visas. Not the answer you're looking for? Browse other questions tagged europe transit-visas layovers filipino-citizens brazilian-citizens or ask your own question.